I reached Phnom Penh at 11am after my final few hours in Kompong Thom. I was up and out of the Mittapheap hotel at 7am but missed Sokhom's daughter by a few minutes, so he took me to Kunthea's school to say my goodbyes and then I caught the Hour Lian bus at 7.30am, thanking Sokhom for his help and his friendship. The ticket to Phnom Penh cost just $2 and I was the only foreigner on the bus. A teenage girl called Lina, sat next to me and spoke a little English but was not a good traveller and was sick for much of the three-hour trip, and was thankful for the half-hour stop outside Skun for a chance to clean herself up. The bus dropped me off at the capital's Railway Station and I got a moto to the Dara Reang Sey hotel, where I was welcomed by the two sisters, Reangsey and Dara, who run the business and immediately plied with food and drink. The Dara is my permanent base whenever I'm in Phnom Penh and the warmth of the welcome is always very special. I'm treated like a King and its a real pleasure to see them and their family when I'm in the capital. After I spent an hour in a nearby internet cafe, a friend of mine, Sopheap, called by the hotel in mid-afternoon to say hello and invited me to lunch the following day before Caroline Nixon, my co-organiser of the Magic of Cambodia day we hold each year in the UK and who was in town for a couple of days, and I met up with two of our mutual friends, Ara and Lina at 6.30pm. 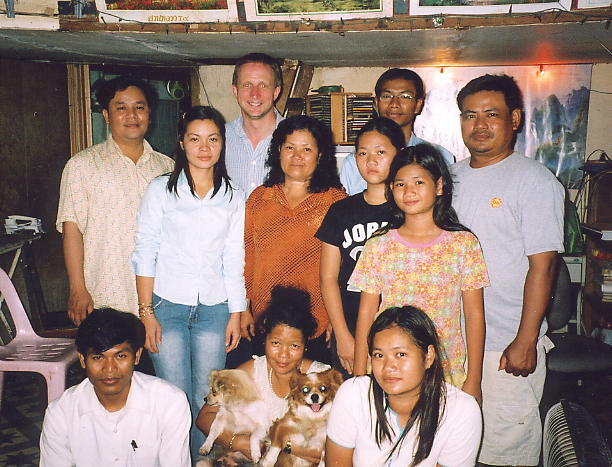 They live with their families in a large house in the Tuol Kauk district of the city and we usually try to have a getogether at their home or at a restaurant whenever I'm in Phnom Penh. This was the first time both Caroline and I had been in Cambodia at the same time, so it was too good an opportunity to pass up. Preak Leap was our destination and Ara's selection of restaurant, the Mlob Sbov Tracherk Chet, turned out to be an inspired choice. The restaurant sits on the banks of the Mekong and our table overlooked the river which was shimmering in the light of a full moon directly opposite our window seat, as we ate our meal of pork, shrimp and savoury pancakes (banh chhau). $4 for the four of us, excellent value, great company and a superb location. We returned across the Japanese Bridge to the city and stopped off at Kandal market, still busy at 9pm, for tikaloks before our friends returned home with the promise of a party at their house in three day's time. The following morning I was up early to walk along Sisowath Quay and enjoy the warm glow of the sunshine before popping into the Frog and Parrot pub on the riverfront for a traditional English breakfast. A little later, I wandered into the popular Rising Sun bar, just around the corner from the Foreign Correspondents Club to see if my favourite waitress, Samnang, was still working behind the bar. The Rising Sun lays on excellent English food and its a place I head for when I'm in town and need a change from meals containing rice! Their jacket potato, cheese and beans, after two weeks in the remoter parts of Cambodia, are heavenly. Luckily, Samnang was at work and in high spirits despite, in her words, putting on a little weight and getting older. 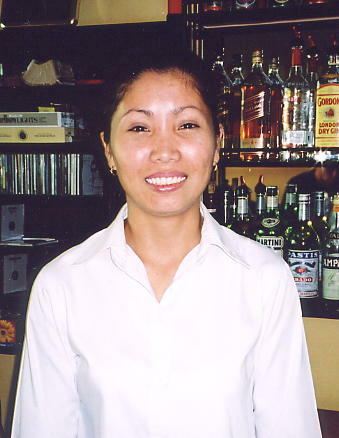 She's got a warm personality, a winning smile and speaks excellent English, a great asset to the pub-restaurant. As mid-day approached, I took a moto to the Last Home guesthouse, on 108 street, to pick up copies of Ray Zepp's latest writings on his travels in Cambodia. I recommend that all those with a keen interest in travelling off the beaten track in this glorious country, not only read my on-line travel tales but also obtain copies of his books. Sopheap arrived at mid-day as we'd arranged to take me to his new home off Monivong Boulevard for lunch - fish soup, vegetables and rice - with his wife Serey and their two small children, Sottary and Vertey, and his sister Mom. Sopheap works at the cabinet office of the Education Ministry and was due to travel to Mondulkiri province with the Minister of State the next day so this was our only opportunity to catch-up. He dropped me back at the Dara at 2pm in time to meet up with my moto-driver Tom (his real name is Thourk), who'd been recommended by a friend. I wanted to visit the Kien Svay area, out along Route 1, in the hope of finding some friends I'd made at a children's party I'd attended in December 2003. I had copies of photos I'd taken that day which I wanted to hand out if I could locate the individuals. It took us an hour to drive the fifteen kilometres in heavy traffic before we reached the village of Srae Ampil, only to find that the house where the party was held was empty. Luckily, we located a couple of the youngsters who'd provided much of the party atmosphere in a house a short distance away and they told us that the others were now in various locations. I particularly wanted to know where I could find Vansy and her sister Matey and they pointed us in the direction of Koki, a town a few kilometres away. Vansy had immediately won me over with her sparkling smile and gorgeous personality at the party. A tomboy at heart, she'd joined in our game of football, tackling as hard as the boys or chasing them around and giving as good as she got. The photos helped as we followed their directions and asked a few people, which finally brought us to Vansy's home, a wooden house on stilts in the outskirts of the town. Now twelve years old, Vansy's nickname is 'little frog' and she's lost none of her charm. To say I was made very welcome is a massive understatement. Her father and mother, as well as grandmother and an assortment of neighbours, eagerly invited me to join them for ice-cold drinks in the shade under their house, whilst Vansy explained that she had just begun to learn English at school and was keen to practice what she had learnt so far. It was a real pleasure to spend time with Vansy, her younger sister Matey and her family and helped by Tom's translation, we were able to communicate pretty well. 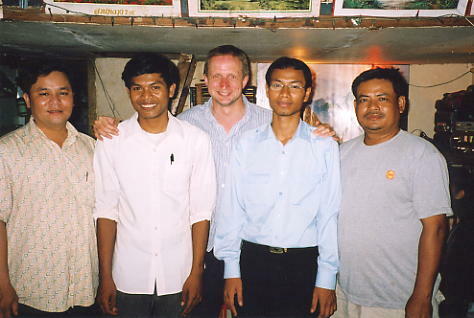 An hour later I had to leave to return to Phnom Penh, but we all promised to meet again on my next visit to Cambodia. We made it back to the Dara at 5pm, with Tom taking me to my next appointment at a house-party at the home of another pal of mine, Peter Leth and his wife Veasna. I'd met Peter at Singapore airport at the start of my trip and this was our first chance to meet up properly. Peter was back in Cambodia working for Unicef on a health and nutrition program and amongst his guests were the author Alan Lightwater who was opening a school in Kompong Chhnang. 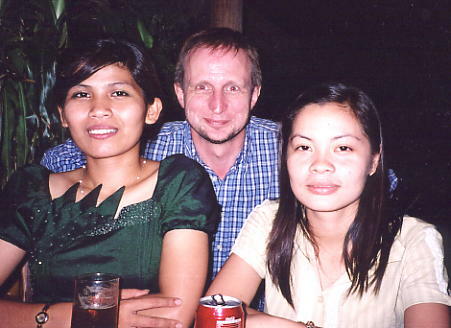 It was great to see Peter and Veasna again, its always a pleasure to be invited to their home as they feed me so well! I was back at the Dara by 10am, having arranged with Tom to spend the following day enjoying a relaxing moto-ride along the Bassac River. The Bassac road and river expedition had been a very pleasant day trip though a hot shower was just the ticket when I returned to the Dara at 5pm. I had a long chat with Reangsey and Dara as they told me a bit about their family history before I took a moto to the Rising Sun for some pub food and then called into the California 2 hotel-bar to meet the owner Jim, a fellow temple-hunter, who pens articles for the Bayon Pearnik magazine and provides travel advice for travellers. In bed by 10pm, I was up again at 7am when an email from my wife was pushed under the door telling me my pc had crashed at home, and not to worry! After breakfast, I walked to the riverfront to phone and email my wife from the Crystal Net e-cafe, also the hang-out of my long-time friend Phanna, who runs his travel agency from the same location. He was on good form and looked very healthy, his agency was doing well and his law studies were progressing nicely. Back at the Dara, I played tot-sey (foot shuttlecock) with three of the hotel's chambermaids before meeting up with another long-time pal, Nick Ray, for lunch at the Rising Sun. Nick had recently completed the next revision of the Lonely Planet guidebook and was also involved in a couple of documentaries beng filmed in-country. He'd also been a star guest speaker at our Magic Day in the UK in September. My afternoon was devoted to the National Museum, a favoured haunt of mine in Phnom Penh. Hot and humid as ever, the museum was full of schoolchildren for much of the two hours I was there, spent inspecting all the sculptures at close quarters, noting that one or two of the larger exhibits were missing and visiting the new wing dedicated to around forty female divinities of varying styles. Nearby, I called into the Friends restaurant, run as part of a program to train street kids, for a drink and met Mel, who recognised me from attending a Magic Day in the UK two years before and who'd been working for an NGO in the capital for the past year. 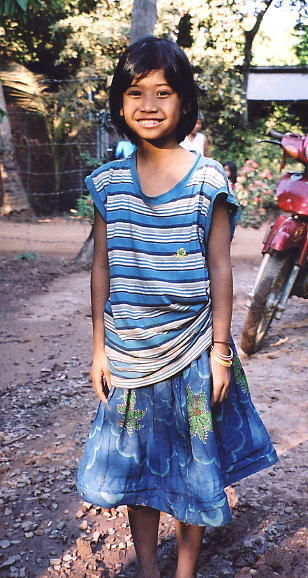 Her friend Lou was on her first-ever visit to Cambodia. At 6.30pm Caroline and I met up again for the party with our mutual friends at their home in Tuol Kauk. Unfortunately, Ara's grandmother had just died and so she had to miss this special occasion. We stopped enroute to buy some drinks and snacks and as usual, we were treated to a veritable feast including curried chicken and fish and a houseful of people. 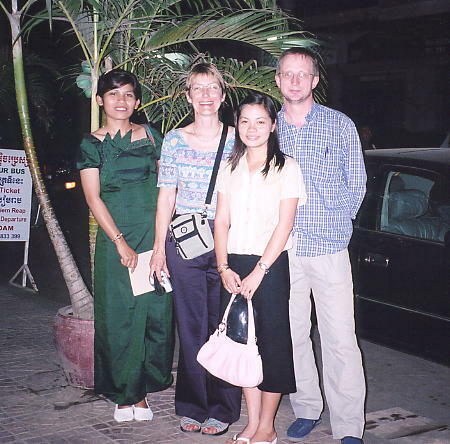 A lovely evening spent with very special friends ended around 9.30pm when Phea returned us to our hotel, as Caroline was off to Kompong Chhnang very early the next morning.